Twenty years ago 'The Great Satan' referred only to a collection of murderous Zionist Jews who illegally invaded Palestine in the 1940s, to butcher the residents and steal their land for Ben Gurion's "Yisrael". But as Zionists later took firm control of the United States, and forced the use of American soldiers in the 1990 Gulf War against Iraq, a subtle change slowly took place. In the minds of about 70 percent of the global population, America had simply become Zionist Headquarters, and was thus itself anointed 'The Great Satan'. Nowadays the contempt and hatred of the civilized world is being directed against ordinary American citizens, who in the future will pay a heavy price for failing to remove a handful of Zionist madmen from Wall Street while they still had the chance to do so. The rest of the world will no longer tolerate the megalomanic 'New Zion', and is now taking active steps to destroy it. Back in November 1962 when President Kennedy forced the removal of Russian missiles from Cuba, very few Americans stopped to ponder whether, at some point in the distant future, the tiny island of Cuba would decide to exact revenge on the United States for this very public humiliation. Forty years ago it all seemed most unlikely, but today the wheel has turned full circle, and a little Fidel Castro payback appears to be just over the horizon. Based on received intelligence, it seems likely that the Island of Cuba will soon be used as 'point man' in a grand plan to deny American warships and other vessels safe transit through the Gulf of Mexico. Quite apart from thoroughly humiliating New York and Washington, such a move will have a far more devastating effect if tankers are denied access to the southern American oil terminals. Without oil imported through its critical southern oil terminals, and also possibly facing denial of access to underwater oil reserves in the Gulf of Mexico, America will collapse in less than six months. How this will be brought about is a long and sometimes complicated story, but bear with me and I will try to make the multi faceted components of this truly multinational operation as clear as I can, in a report normally limited to a mere 3,000 words. To do this we must first circle the globe, picking up seemingly random pieces of the operational jigsaw on the way, until the last piece slips neatly into place less than 200 miles south of Florida Keys. As you may expect, there is really nothing random about the process at all - merely the understandable caution and strategic camouflage of a multinational coalition closing in on the most dangerous and brutal nation on Planet Earth since early in the 20th Century. During the last thirty years alone, America's Zionist controllers have ordered the calculated murder of more than six million innocents around the world, and the world is not prepared to tolerate another six million innocents being murdered by Zion during the next thirty years. Much has happened during the past few months, so now we have to slip back in time in order to discover the intriguing answers to why Middle East LNG (Liquefied Natural Gas) is now heading east rather than west; why Russia has forged an ironclad coalition with China, India and Brazil, and why the Zionists really want the UN's International Atomic Energy Agency chief Mohamed El Baradei removed from office. Finally we will have to show the connections between these events and future mayhem in the Gulf of Mexico. On 10 November 2004, the India Daily reported that, "Russian President Putin is taking a lead role in the most powerful coalition of regional and superpowers in the world. The coalition consists of India, China, Russia and Brazil. This will challenge the superpower supremacy of America." ∑ "He [Putin] wants to establish a long-term Russian footprint in Latin America in order to expand Moscow's geopolitical influence in the region. Brazil is very open to the coalition concept where these large countries support each other in term of trade, economics, international politics and defense." Just this single strategic move means that the new coalition embraces just over three quarters of the world's total population, eighty percent of its natural resources, and a majority of technical and scientific experts. Nor does it end there, because the coalition automatically includes the Shanghai Cooperation Organization (SCO), which is presently comprised of China, Russia, Tajikistan, Kazakhstan, Kyrgyzstan and Uzbekistan. Dangerously for America, the coalition will soon have another important member, Iran, currently due to enter informally in a few months time through the SCO "back door" because of a mammoth energy deal. We will return to Iran shortly. Obviously from the Zionist perspective, the most disturbing new member of the coalition is Brazil, because New York has long believed and insisted that the whole of Central and South America is under its personal "protection", which is just another way of claiming that Zionists can pillage the place whenever they want to, proved by countless CIA atrocities in almost every American country south of Puerto Rica. Now then, what would happen to this cozy pillaging arrangement if Russia-friendly coalition partner Brazil decided to develop nuclear weapons? On 16 November 2004, just six days after Vladimir Putin formally introduced Brazil as a member of the new coalition, IAEA inspectors from Geneva visited Rio de Janeiro. Just eight days later on 24 November 2004, Brazilian Energy Minister Eduardo Campos announced that the IAEA had issued Brazil with a permit to commence the experimental stage of uranium enrichment. Paranoia immediately swept down Wall Street at the speed of light, and within hours the White House was pathetically whining that IAEA chief Mohamed El Baradei should be removed from office. Dark hints by the New York Times that El Baradei had "not been doing enough in Iran", were just a hasty smoke screen. For many years the Zionists had a fallback plan in case global conquest became impossible. Code-named "Fortress Americas", the plan relied on the USA being able to conquer both Canada and South America, thereby building themselves an impregnable redoubt in the Western Hemisphere, to provide cover while rebuilding their strength. I wrote two long reports on this top-secret plan, which are linked at the bottom of this page for those who wish to study the details. With Brazil now a full coalition partner with Russia and China, "Fortress Americas" was already doomed to failure, especially because Vladimir Putin had been economical with the truth when he named the coalition members. Venezuela had already signed up in secret, but this was kept under wraps for fear of alerting the CIA to what was to come next. As most readers know, Venezuela has massive oil reserves that America relies on heavily, and premature exposure might have led to rash military action against the country, in order to seize the Venezuelan oilfields in the sacred name of "American National Security". In its normal crude way, the CIA had already given advance warning of this intent by planning to shoot down Venezuelan President Hugo Chavez's aircraft in late September, when he was en route to address the United Nations in New York. Fortunately for Chavez and his country, Venezuelan Intelligence received advance warning and blocked the President's flight. The CIA shoot-down was to be followed 14 hours later by "phase 2", an attack on the Presidential barracks while the country was still in shock about President Chavez's 'accidental death', thus capturing Venezuelan oil and handing it to America on a plate. Of course the CIA should have cancelled "Phase 2" the minute it knew that the Presidential aircraft had not taken off from Caracas for New York, but sadly the CIA planners forgot, and the Presidential barracks attack force was swiftly overwhelmed by a very alert Venezuelan military. Needless to say, "Phase 2" proved that "Phase 1" was very real and accurate intelligence, in turn proving that the Zionists had yet again ordered the murder of a head of state for monetary gain, a long standing tradition on Wall Street. Within days Russia 'agreed' to provide Venezuela with fifty Mig 29 fighters, because it was obvious that Wall Street would try again later if a deterrent was not put in place, and Chavez could hardly rely on America to send spare parts for his fleet of aging F-16s. New York was furious of course, but could hardly do anything about it. And besides, what harm could 50 Mig interceptors a thousand miles away do to America? New York had made the fatal error of assuming that the Migs in question were being delivered exclusively to protect Venezuela against American bombers or troop transports. In fact, all fifty aircraft are Mig 29 SMTs, the very latest in Russian technology with enhanced attack payload capacity and a Plasma Stealth System. Hardly the aircraft one would choose for a Red Baron dogfight at 15,000 feet, now is it? All Venezuelan Mig 29 SMTs are painted dark blue, which may be part of the stealth system, but more commonly denotes that the aircraft will be used for low level attacks over water. When nosey European diplomatic officials asked Venezuelan Air Force generals why they needed such sophisticated aircraft, the generals responded "To protect the Panama Canal". When asked against whom, the air chiefs wouldn't specify. 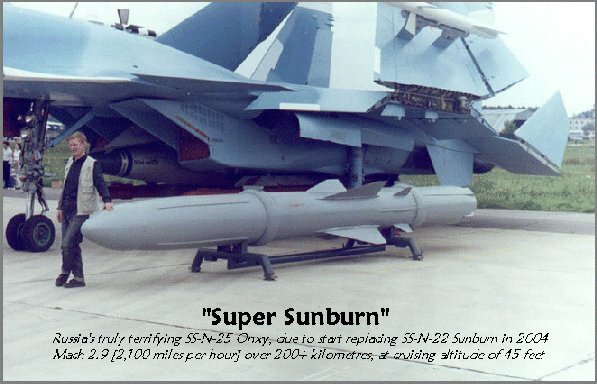 What absolutely no one outside Russia and Venezuela knew until two weeks ago, is that 20 of the fifty Mig 29 SMTs are fully equipped to carry and fire the devastating SS-N-25 [and now SS-N-26] "Onyx", a devastating and completely unstoppable Mach 2.9 ramjet anti-ship cruise missile which skims the waves at twenty feet, before delivering a knock out blow to its maritime target more than 200 kilometers away. So great is the kinetic energy at the point of impact on the target, that Onyx can sink an American aircraft carrier or supertanker using only a conventional penetrating warhead. Those scientists who might doubt this should calculate the impact energy of 5,500 pounds of missile striking a carrier or tanker at a terminal velocity of 2,460 feet per second. It is understood that Russia is providing Venezuela with a stockpile of forty anti-ship Onyx missiles. "A mere two months ago, the news of a China-Kazakhstan pipeline agreement, worth US$3.5 billion, raised some eyebrows in the world press, some hinting that China's economic foreign policy may be on the verge of a new leap forward. A clue to the fact that such anticipation may have totally understated the case was last week's signing of a mega-gas deal between Beijing and Tehran worth $100 billion. Billed as the "deal of the century" by various commentators, this agreement is likely to increase by another $50 to $100 billion, bringing the total close to $200 billion, when a similar oil agreement, currently being negotiated, is inked not too far from now. "The gas deal entails the annual export of some 10 million tons of Iranian liquefied natural gas (LNG) for a 25-year period, as well as the participation, by China's state oil company, in such projects as exploration and drilling, petrochemical and gas industries, pipelines, services and the like. The export of LNG requires special cargo ships, however, and Iran is currently investing several billion dollars adding to its small LNG-equipped fleet." 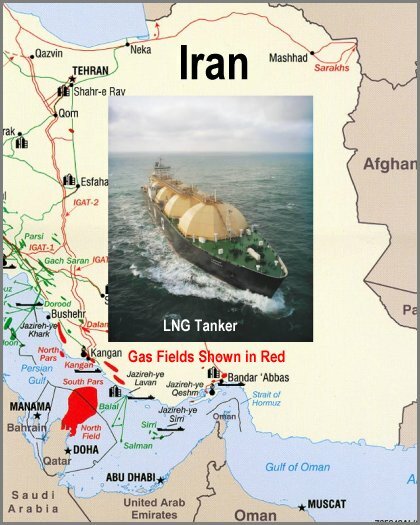 Though America officially refers to Iran as part of the "Axis of Evil", this does not stop it importing very large quantities of Iranian LNG through third parties. Now all that will come to a grinding halt, because Iran must naturally focus exclusively on filling its mammoth Chinese commitments. Thus on 2 December 2004, the block on external energy supplies to America started in earnest. At the same time, Iran effectively came under China's protection, because any American attack on Iran will impact directly on Chinese National Security by severing its energy resources. It is but a small step for Iran from there to full membership of the Shanghai Cooperation Organization (SCO), and overall protection by the Russian-Chinese Axis. There is a curious oriental twist here, because the mammoth Iranian LNG contract with China will also have a major negative impact on "Coalition of the Willing" partner Australia. 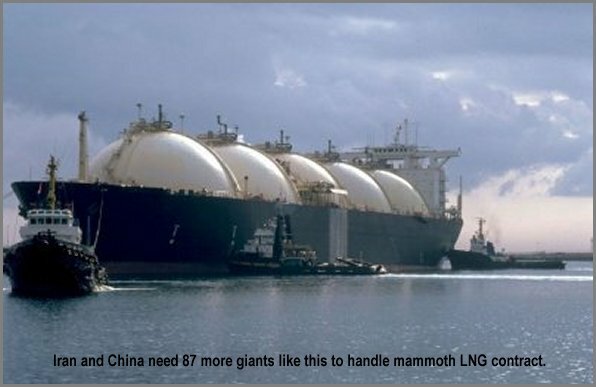 Back in 2002 there was a huge fanfare when the Australian Government trumpeted news of an annual 3.3 million ton LNG export deal to China, due to commence in 2006 and last for 25 years. Does this sound familiar? Unfortunately for Australia, the Iranian-Chinese deal was effective the day it was signed in late November 2004, and both countries have admitted that between them they will need to build another 87 LNG tankers just to keep up with their initial supply from the huge Iranian Pars gas field. In the view of this author, the Chinese will default on the Australian deal, which is probably a suitable punishment for the obsequious cretins in Canberra who agreed to "help" the Zionists in Iraq. America is already desperately short of energy, and it can only get worse. Iraq is producing nothing at all as usual, and the Republican Guard will ensure it stays that way. OPEC will slow down production in January because it actually has to. If the OPEC countries keep pumping at their present outrageous rates to please America, they will eventually destroy their own economies by terminally damaging their producing wells. This leaves the largest single oil producer in the world, Russia, to increase or decrease world oil production to suit its own (or its new coalition's) global agenda. The New Russia-China-India-Brazil coalition really means business, and it would be wise to remember that after reforms at the United Nations, all four will have permanent seats on the Security Council. But that is after the likely confrontation in the Gulf of Mexico, designed to either make America withdraw completely from the rest of the world and become relatively poor, or face devastating and total economic ruin. It has been suggested to me that the choice will probably be left to the American people, if they can terminate a few dozen N.W.O. Zionists fast enough. Despite Venezuelan claims that they want to use the Mig 29 SMTs to protect the Panama Canal (which is true to a certain extent), their most obvious use initially appears to be that of defending Venezuela against an American aircraft carrier strike on Caracas, or elsewhere in the country. Yes they can do that, because any U.S. carrier getting close enough to launch its aircraft against Venezuela, can in turn be sunk very swiftly indeed by one or two of the lethal and unstoppable Onyx missiles. However, this would not stop a strike by long range ALCMs dropped by B-52 bombers, another cowardly Zionist weapon of mass destruction. What then? This is where the really clever bit comes in. Russia has arranged for the Venezuelan pilots to receive their advanced Mig 29 training in Cuba, which already has six earlier version of the aircraft. So the Cuban instructors are well up to the job, but don't have the latest Mig 29 SMT model that the Venezuelan Air Force has. Well, not until next week anyway. Russia is donating four [Onyx equipped] Mig 29 SMTs to Cuba free of charge, for use in training the Venezuelan pilots and then to add to their own inventory. Agreement has also been reached for joint exercises in the future, using Cuban airspace. All of a sudden, America will be facing the same deadly threat it faced when arguing with China about the future of Taiwan. Basically, China demonstrated the awesome accuracy and power of its SS-N-22 Sunburn and SS-N-25 onyx missiles against moving unmanned maritime targets, and the U.S. Fleet swiftly withdrew. 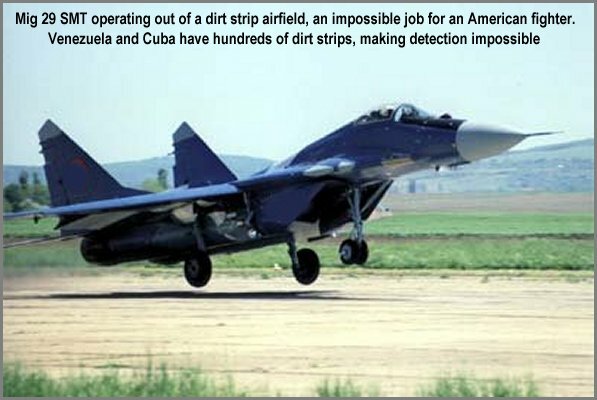 So how is the U.S. Navy going to feel when every dark blue Mig 29 SMT flying off a dirt strip in Cuba (yes, they can do that), is possibly carrying an Onyx missile capable of sinking any American ship within a tactical radius of 600 miles? It seems beyond doubt that the main message will get through, i.e. 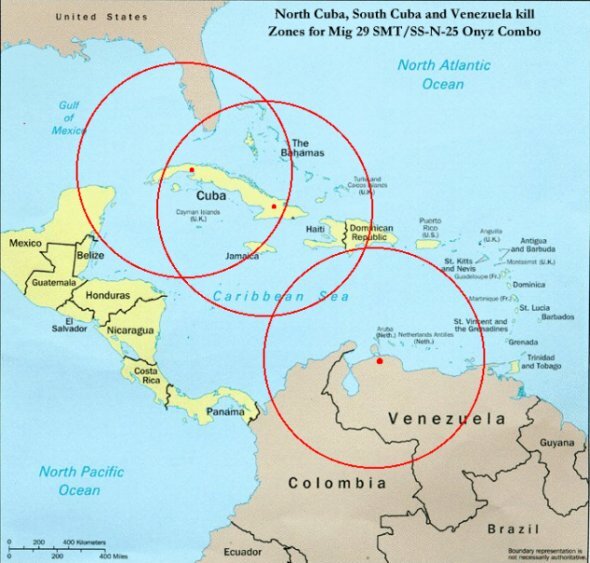 that if America dares to attack Venezuela or even little Cuba, every supertanker approaching the American southern oil terminals through the Gulf of Mexico, will be sunk by an invisible Mach 2.9 missile exploding in a white fireball. Worse still, there is the possibility that some of America's offshore oil platforms in the Gulf might also be destroyed, causing savage blowouts that will burn for ten years or more. There will be those who read this report with cynicism, sneering as always that no one would dare do this to the "only remaining superpower on earth". You think not? Yesterday morning Venezuelan President Hugo Chavez flew to Beijing, where Chinese officials have said he will be on an official visit extending until Monday 27 December, a total of five days straight. Evidently the Chinese regard President Chavez as a very important Head of State, which is hardly surprising when you understand the reason for his visit. Until the Zionists tried to murder him back in September, Chavez was reasonably happy supplying America with 2.7 million barrels of oil per day, which is about 80% of Venezuela's total production. The attempt on his life was one giant step too far though, so Chavez is now in Beijing negotiating to sell the entire 2.7 million barrels per day to China instead. King of kings’ Bible – Revelation 16:12 And the sixth angel poured out his vial upon the great River Euphrates; and the "water" thereof was dried up, that the way of the kings of the East (eastern block) might be prepared. 38:14 Therefore, son of man, prophesy and say unto Gog, Thus saith the Lord "I AM"; In that day when My people of Israel dwelleth safely, shalt thou not know [it]? 38:17 Thus saith the Lord "I AM"; [Art] thou he of whom I have spoken in old time by My servants the Prophets of Israel, which prophesied in those days [many] years that I would bring thee against them?